More New Miniature Gardening Books! What if you could live in a dollhouse? Wow, twice in two days! 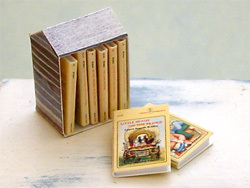 Etsy artist Carly, aka stitchntyme (visit her shop for lovely fabric and embroidered accessories), included my miniature "Little House on the Prairie" book set in a treasury called "IT'S A small, small WORLD." The collection features vintage, cottage-style miniatures. Thanks, Carly! You can purchase the miniature "Little House on the Prairie" set on my website! Wow, thanks for posting the Treasury in your Blog, very appreciated! Your mini books are to die for. I would love to buy every one of your sets.